Good value for frequent Delta customers looking to upgrade their loyalty status. The information related to the Platinum Delta SkyMiles® Credit Card from American Express and the Delta Reserve® Credit Card from American Express has been collected by ValuePenguin and has not been reviewed or provided by the issuer of this card prior to publication. The Platinum Delta SkyMiles® Credit Card from American Express is a balanced card that helps Delta consumers earn status related benefits. We performed an in-depth breakdown of the cards best features and how it stacks up against the other SkyMiles options you may have. The Platinum Delta SkyMiles® Credit Card from American Express is ideal for existing Delta frequent flyers looking for additional pathways for achieving higher loyalty status with the airline, or maintaining their current status for the next year. The main features of the card are the bonus Medallion Qualification Miles used in Delta's loyalty program, with bonus MQMs available in the first year for new American Express card holders. As with its counterpart the Delta Reserve® Credit Card from American Express, these awards don't come cheap, so the card is most suitable to business travelers or frequent passengers of the airline. 35,000 bonus miles and 5,000 MQMs after spending $1,000 in the first three months of account opening. Overall the Platinum Delta SkyMiles® Credit Card from American Express offers most of the important benefits of the Delta Reserve® Credit Card from American Express, but at a significantly lower annual fee. In comparison to the Gold Delta SkyMiles® Credit Card from American Express, the Platinum Delta SkyMiles® Credit Card from American Express is superior in almost every way. The already mentioned bonus MQMs as well as the annual companion certificate easily make up for the difference in annual fees, if your goal is to have a card that helps you get more out of Delta travel. Like the Delta Reserve® Credit Card from American Express, the Platinum Delta SkyMiles® Credit Card from American Express will give cardholders an annual companion certificate that is good for an additional seat on a US domestic flight. The ticket is restricted to Economy class only, unlike the Delta Reserve® Credit Card from American Express which allows both First and Economy class. The narrower use of the companion certificate on the platinum card isn't much of a drawback, as the differences between first and economy class seats on most domestic flight's isnt really that big. One thing to note about the certificate: While other airline credit cards will reward you with a similar certificate year one, you will only get the Delta certificate after your renewal. This perk only kicks in after the beginning of your second year. With the US Airways Credit Card for instance you'll get a domestic ticket a few weeks after approval. While Skyclub access with the card is discounted, it's not free, costing you $29 per person. Considering that you can pay for access at a cost of $50 dollars, the value of this perk is pretty limited since we doubt the $21 in savings is enough to make lounge access an attractive feature. The spending rewards for the Platinum Delta SkyMiles® Credit Card from American Express are average among travel cards. Structured as 2 SkyMiles per $1 spent on Delta related spending and 1 SkyMile on all else the earning rewards don't really separate the card much. Overall cardholders can expect the SkyMiles to be worth on average 1.2 cents per SkyMile with the potential rates to be as high as 2-3 cents each. Your first option is to redeem SkyMiles for an awards flight where a set amount of miles are used in exchange for specific routes. The amount of miles necessary will vary depending on the route you pick, the class of ticket and the demand classification of the flight. Delta also classifies each flight into one of three categories: Saver, Standard or Peak adjusting the amount of miles based on how much demand there is for the flight. For roundtrip flights originating in the United States to other destinations within the continental United States, Canada and Alaska, you'll need 12,500 to 30,000 SkyMiles for a flight. One thing to consider is that the lower end Saver tickets which is usually the best deal usually has limited availability. You should expect to need at least 20,000 miles or more if you value flexibility. Business class will require about double the amount of rewards for a similar route. For longer haul flights like US to Europe mileage will range from 30,000 - 65,000 while US to Asia will can require 35,000 - 80,000 SkyMiles for economy class flights. For a comprehensive list of the SkyMiles requirements for Awards bookings consult Delta's chart. Beginning in 2015 Delta will be changing some of the mileage requirements for the awards chart, as well as introducing the option to use awards for one way trips which is currently not available. Awards flights can also be booked on any of the SkyTeam Global Alliance carriers. These carriers are Aeroflot, Aerolineas Argentinas, AeroMexico, AirEuropa, Air France, Alitalia, China Airlines, China Eastern. China Southern, Czech Airlines, Garuda Indonesia, Kenya Airways, KLM, Korean Air, Mea, Sauda, Tarom, Vietnam Airlines, Xiamen Air. 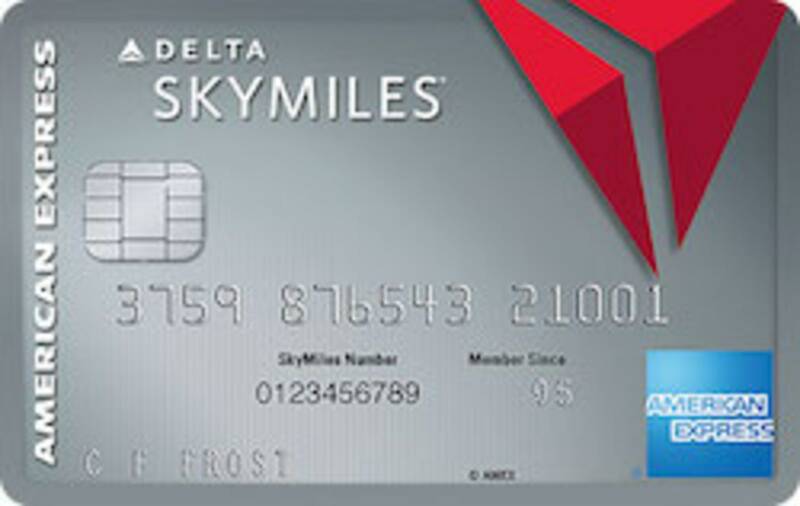 The second way to use your Delta SkyMiles for flights on Delta is to leverage their pay with miles option. This allows you to purchase a ticket directly from Delta for cash using the accrued miles to offset some of the cost. Miles used in this way are converted at a 1 cent per SkyMile if you redeem for a flight costing more than $100, less than what you can expect on an awards flight. While you may be getting less overall value from your points, you do benefit by being able to use the points in smaller increments. You're also able to apply them to more flights which is a plus if you value flexibility. Delta is one of the few airlines we're aware of that permits its members to use awards in this way. You should never use this option for fares costing less than $100 however. Your redemption options there are to use 25,000 miles to cover the cost of the entire fare which is an awful conversion rate. The heart and soul of the Platinum Delta SkyMiles® Credit Card from American Express is the bonuses, especially the MQMs. This card and the Delta Reserve® Credit Card from American Express counterpart are pretty much your only options for getting Medallion Qualification Miles outside of flying Delta airlines. This is especially important if you find yourself coming up short when it comes to achieving the next status tier since the welcome and annual bonuses combined can contribute to 1 entire status level upgrade. For the Platinum Delta SkyMiles® Credit Card from American Express to be worthwhile, make sure you're able to spend enough to hit both the $25k and $50k spending thresholds for the annual miles boost.